In a previous post I mentioned I had read Masanobu Fukuoka's The One-Straw Revolution (available as a free download here. Thanks Chris!). It's a very interesting book for a number of reasons. One is that he has developed a very good work-smarter-not-harder system for growing grain. Our situation is different, so I have not figured out how to fully utilize his techniques on our homestead, but it's encouraging to see it done. In one chapter he shows two diagrams of what he calls "Nature's Food Mandala". I really liked that idea and adapted it to what I'm calling my "Harvest Wheel". Mine is based on my regional growing season and what I've been able to harvest over the years and when. It does not include preserved or stored food, only fresh. That means it isn't a complete picture of being food self-sufficient. Also it is somewhat idealized because it assumes ideal growing conditions, which don't happen every year. 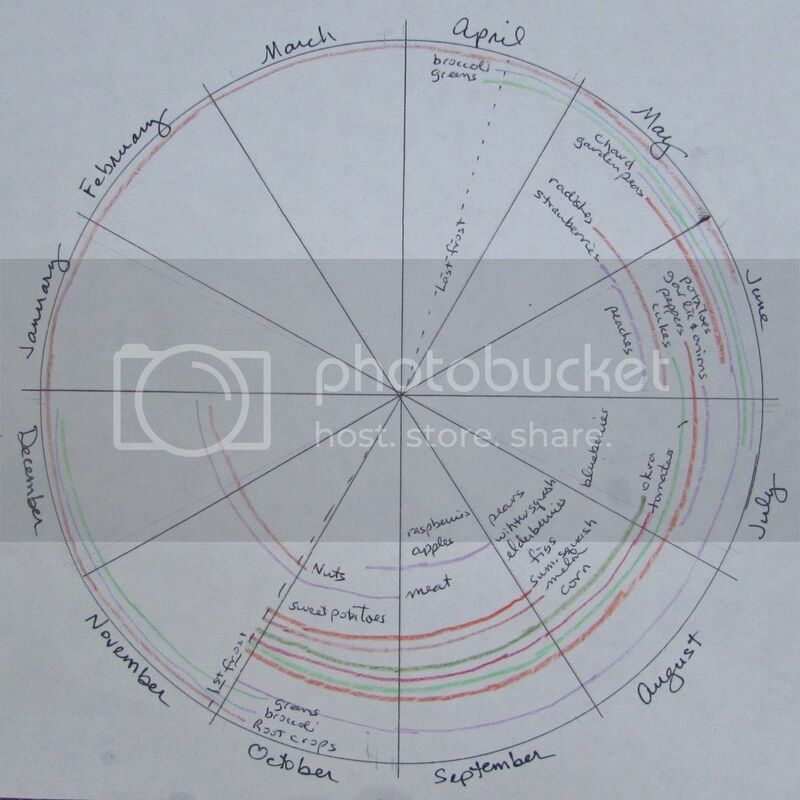 Still, is a valuable visual tool to help me plan my planting. I'm still working on it and I'm sure there are some things I've forgotten; shell beans for example. Even so, it is encouraging to see how much of the year we're able to grow and harvest food. Also it gives me an idea of where the harvesting gaps are so I can focus on filling them, for example winter gardening, hoop houses, even a greenhouse. My goal is to grow more fresh and preserve less. As an analysis tool, I'm hoping this is a step in that direction. Next I'll work on a planting wheel. Have you looked at Eliot Coleman's Four Season Harvest? I never got the chance to try any of his ideas but they seemed do-able. That is a great idea. I have always wanted to read that book but my library doesn't have it. So thanks for the free download link! I've been think about how to apply Masanobu Fukuoka's ideas to your homestead. Have you considered a small patch say 4 by 12? I would look into upland rice. It doesn't require flooding. I considered growing some but never got to it. Bountiful Gardens had seed at one time. Thanks Quinn. There's something about a graphic that communicates "at a glance" as they say. It feels very useful! Judy, I think my library has a copy because I recall flipping through it. I'll have to look again. I know it's a very popular book. Dawn, we're going to do our first hoop house growing this year too. It's been on my to-do list every year, but this year we're finally making a start! You're welcome. It's a very interesting read. Chris, that's so true. To make the chart I started with lists, but somehow they don't communicate to me as well! It's nothing surprising, but it's helpful just the same. Great thought process, Leigh. Now you've given me more to ponder. I am really hoping to increase our ability to harvest food to the 'year round' mode with the addition of our greenhouse. I can't see where we can grow anything in there in the hot summer months, it will just be too hot. But the fall, winter and early spring should see it full of edible plants as well as seedlings for the garden. Fern, I'm thinking along the same lines in regards to summer. It's worse when we get a dry spell. I think we all have a mental idea of our harvest seasons, but seeing like this is giving me food for thought. Yes, read Eliot Coleman's Four Season Harvest. It is full of inspiration as is his Winter Harvest Handbook. Can't wait to see what you do with a hoophouse. Mine has been lacking attention and I know I could be doing so much more with it. It seems we are working in the same direction. After this catastrophic summer (we have started to harvest tomatoes this week), we have decided to grow crops only when water is available, with means creating microclimates for spring and fall and a hoop house for the winter. We are hoping to reduce growing plants in summer so we can use the little water we have for survival watering of perennials, shrubs and trees. Lucia - have you looked into Steve Solomon's Gardening When It Counts? The book is about gardening in places with hot dry summers. Leigh, I like this harvest wheel but don't understand what you'll do in winter if you don't preserve now? I'll have to check it out from the library. I need inspiration! Lucia, there seem to be several of us thinking along the same lines. And Judy, thank you for another book recommendation! I'll have to look that one up when I get Eliot Coleman's book. Leigh, I agree with Erika (next comment), you need to get Eliot Coleman's book. It is one that I have read most of and has given me many ideas for our greenhouse. I bought it years ago when we were still in the planning stages. It is well worth reading. Ditto to Erika's comment. My accountant brain loves a chart. I thought for sure I'd seen that book at my library; I must have flipped through it at a bookstore. Dang. Ditto for the Steve Solomon book. So now the hunt is on. That's really neat -- it organizes it so well in one spot. Nice! Wonderful post. Since going back to work I've had to reduce the size of the garden and the livestock "collection"...more with less. I grow a year round garden and that has really helped with reducing the amount of time spent canning and dehydrating. Love your Harvest Wheel. Thanks! It is interesting to see it in a picture. That's encouraging to hear, Lynda. And that's what I hope to accomplish as well. Thanks for the tip, Judy. I'll look into it. I like this idea. Thanks! The Shepherd based his whole vegie garden on the One Straw Revolution - he has never rototilled and the soil out there is fantastic - rich, black, full of worms - they love that sheep poop. Glad your rooster came home. Silly guy. Do you suppose he has the answer to why the chicken crossed the road? Ha ha ha.... T.